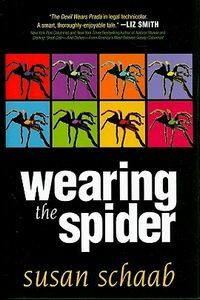 Wearing the Spider by Susan Schaab, a Mysterious Review. Review: Susan Schaab crafts an intriguing tale of corporate malfeasance in Wearing the Spider, a suspense thriller set largely in a mid-sized New York law firm. Evie Sullivan is a hard-working corporate lawyer who's looking forward to becoming a partner in her law firm. When evidence begins accumulating that her work is sloppy, late, and in some cases, simply wrong, she suspects that a fellow lawyer is trying to make her look bad to the partnership committee by intentionally altering her work, delaying its release to clients, and fabricating information. But as she delves deeper into clearing her name, she discovers a potentially damaging, and possibly illegal, conflict of interest that not only jeopardizes her career but puts her life in danger as well. For the most part, Schaab succeeds in generating and maintaining a high level of suspense. It's unnerving to think that someone can simply use another's identity, in this case Evie's, to conduct illicit activities, but every attempt she makes to correct it is met with irrefutable evidence that she is, in fact, at fault. The author nicely balances specific technical details, about how documents are managed on corporate networks, how calls and e-mail messages are logged, and the like, are incorporated into the story yet don't get in the way of the plot. Evie finds herself in a number of situations that she can't be sure are legitimate, none more mysterious than the relationship she has with Joe Barton. Is it just a chance meeting on an airplane that brings them together? Does he know more about what's happening to her than he lets on? Is his offer to help actually a trap to ensnare her further? It might have been more interesting, more satisfying and suspenseful, and certainly more original had Schaab reversed the genders of the principal attorneys involved. It's little more than a cliché that Evie is portrayed as the female lawyer who has to work twice as hard as her male counterparts to get a partnership and is therefore a victim even before her identity is used by a male lawyer to cover his tracks. The fact that the story is dominated by male characters further reinforces the notion that Evie seems to be alone in her struggle to prove her innocence. On a stylistic note, Schaab's frequent use of italics in her text is distracting to the point of being annoying. Written in the third person, italics are used whenever Evie is thinking in the first person: "A question emerged in her mind: should she call Joe? No, he'll think I'm crazy. It's too late to make a plan for tonight." All well and good. But italics are also used extensively for emphasis, sometimes inexplicably: "I can't believe after all the work I've done, I have to worry about being set up by a partner. You know, I actually made him look good in a conference call with a client yesterday. You know how nonchalant he can be with the details of a transaction. You'd think I could expect some professional courtesy for at least a few minutes afterward." Rarely a page goes by without multiple invocations of italicization to no obvious purpose. Acknowledgment: Susan Schaab provided an ARC of Wearing the Spider for this review.